I’m 41.. Top 50 for me! SQLShack community web-site by company ApexSQL have announced on 1st of September 2018 the list of SQL Server bloggers. The list of top SQL Server bloggers is absolutely worth checking for entry-level learning, for troubleshooting and for advanced topics. There are also many other top list of bloggers – PowerShell and others. Based on ALEXA ranking the list for sorted by relevance. My blog also managed to get on the list, humbled and honoured to be recognised for my community work. Congrats to all SQL fellows and SQL family and all the SQL lovers. Thank you also to SQLShack community for doing this. Years ago, with SQL Server 2016 release, Microsoft came up with a separated brand new version of SQL Server Management Studio. It’s been a happy day for the SQL Server community and database developers. Shortly afterwards, our company started to migrate every instances from older version of SQL Server to the 2016, using SSMS 17.*. Developers have already jumped into Visual Studio 2017 and everything seemed to work like a charm, until we started deploying integration services via the new SSMS, after we converted them to 2016 TargetServerVersion (which is NOT the Project Version). The TargetServerVersion is the SSIS version, also for the deploy operations, while the Project Version setting tells to Visual Studio how to open projects based on .dtproj specifications on the XML projects definitions. The computer I’m speaking of has the same build of mine, nobody has installed any other Integration Services versions anywhere. Andy Leonard explained this behavior in this blog post. Unfortunately, in my scenario, I cannot solve the problem. Let’s try to explain better. Ok, now we’re going to deploy to the other machine, generating the .ispac file and double clickin on it. It’s important to make sure that you’re double-cliking the .ispac file. Do not right click on the Integration Service Catalog project folders because SSMS will execute the latest build of ISDeploymentWizard.exe by design. Hey! This is 2017 also when clicking on .ispac file. Let’s try to deploy using the new tool. The deploy succeeded. I’ve tried on six different machines, five ran successfully and ONLY ONE returned the above error message. Still stuck in the middle. Just the setup of SSMS (17.8.1) updating the 17.7 one. Once again, the same setup on all six machines. Five by six worked, this one is trying to kill me. For some strange reason, something (I assure you all, not someone) has changed the registry in the .ispac application association, maybe when double clicking for the first time the file in a pending reboot (?). We’re still investigating, since we used to avoid any change in production without permissions and processes. That said, it’s weird. And it was so difficult to get. Easy to say, now that we’ve figured out the root consequence. Not so good, but changing the registry on the key HKEY_CLASSES_ROOT\.ispac with the 130 executable (IntegrationServices.ProjectDeploymentFile.130) fixed the unwanted behavior. The key has been set to IntegrationServices.ProjectDeploymentFile.140 right after the update from 17.7 and 17.8.1. Instead of changing it via regedit, you can try an “open with…” with “use default” checked in order to force the association between .ispac file and the right ISDeploymentWizard.exe version. But this time, in this machine, it didn’t work. This is the reason why I tried the regedit action. I have to say a big thanks to Andrea Amantini, one of my peer, which is well known for his ability to find out “a needle in a haystack.”. Strange things happened here. A combination of Murphy’s law, a sort of “black” friday and a pending reboot. Hopefully this helps someone, at least. The SQL Transaction Log reader is a standalone utility, which helps to view SQL server transaction log files without any difficulty. It is capable enough to preview LDF activity, including Transaction, Time, Name, Query and Table Name. Moreover, it allows a user to fetch and display all records from the live database. This application offers an option to filter and export as SQL database, as SQL script or CSV file format. It supports to analyze one or more NDF data files without losing a single bit of data. Also, it is compatible with all latest Windows versions, including Windows 10 and its below versions. Demo Version: The demo version of the software is freely available for download and supports to preview of SQL Server Transactions (INSERT, UPDATE, DELETE), preview Login users that has made changes on database tables, transaction Query, Time. But, doesn’t allow to export Transaction details for recovery purpose. 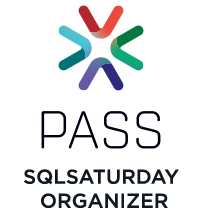 Licensed Version: The licensed version of SQL Transaction Log reader tool permit users to preview all the records within the database. Moreover, it can open and read the complete log activity in SQL server database. Also, it allow you to export all tables data along with deleted records direct in SQL Server Database or SQL Server Compatible script or CSV format. Allows to View Multiple LDF Files: SQL LDF File Viewer permits you to open and read multiple transaction log files activity in single go. For this, you just need to add parent .ldf file of your database, if you are scanning with offline option. The software will scan and preview transaction activities of all other .ldf database files of that database. Multiple Times and then Delete: SQL log file reader allow you to preview the transactional activity of same record (Updated multiple times and then Delete). This will allow users to track all the database changes for a specific record. Auto Fetch SQL Server Name: While scanning the transaction logs of a specific database with Online DB option,The SQL transaction log reader tool will allow you to click on drop-down button to auto fetch the Server Name. In case, the software doesn’t shows the desired Server Name, then you can enter it manually. Preview All Transaction Records: SQL Server log file viewer scans and load all available tables transactional activities, present in SQL database and creates a preview. It will help to view SQL transaction log file with fields such as Transaction, transaction time, Table name and query. Users can view all records with Login Name Authentication for Insert, Delete, Update etc. Option to Sort LDF File Elements: The sorting option is available within SQL Log viewer to re-arrange the order of the listed items. Moreover, users can sort each element according to their properties such as transaction, transaction name, transaction time, table name, and query. 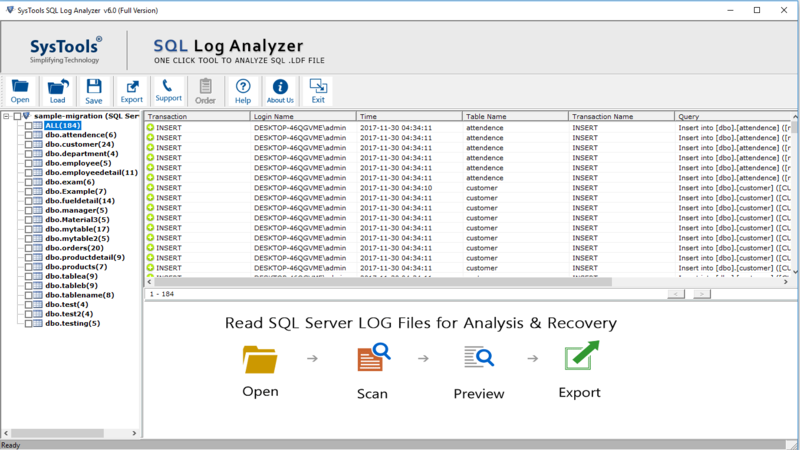 Scan with Online or Offline Options: The SQL log file viewer offers two different scanning options to read transactional activities of your database. The Online option asks for SQL Server information like: Server Name, Authentication Type. In Offline option, the software will allow you to browse .ldf file along with its associated .mdf file and preview the transaction log activities. Export Selective Tables: While moving the SQL LDF file queries, you can check or uncheck all tables for saving only selected data. If you want to restore SQL Log file data from the desired table, then, select and export the desired tables direct to SQL Server Database or SQL Server compatible script or CSV format. After considering the overall functionality of the software, we can summarize that SQL Transaction Log Reader is a reliable tool that allows a user to read and view multiple .ldf files. The software is capable enough to view SQL transaction log with fields such as Transaction, transaction time, Table name and query. Regardless, we can say that the SQL log Viewer is a robust software due to its great features. Anche quest’anno Agile@School è giunto al termine. Il percorso è stato come sempre ricco di nuove esperienze, imprevisti e soddisfazioni; un modo per osservare come le classi di studenti siano in grado di applicare gli insegnamenti portando a termine progetti fatti, finiti e funzionanti. Sarà proprio questo il tema centrale del post: la presentazione dei progetti. Non ci soffermeremo sui singoli team perchè ognuno di essi, con i propri pregi e difetti, è stato in grado di mostrarci quanto di meglio potesse creare e di esporlo a tutta la classe. 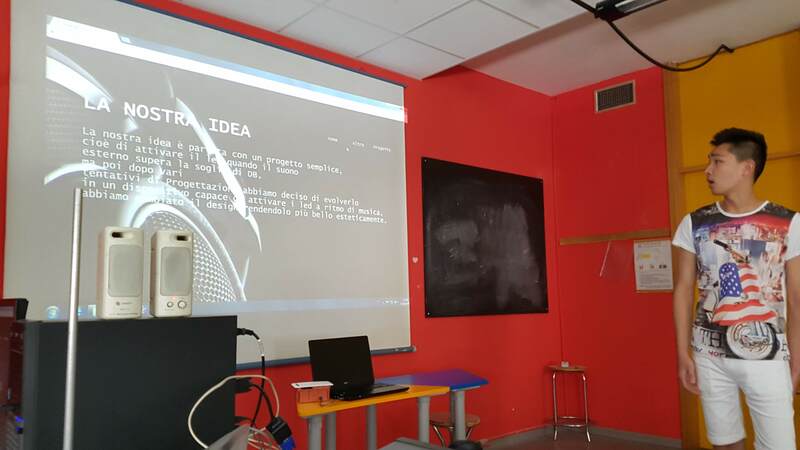 Ciascun team è stato chiamato ad esporre sotto forma di *pitch* il proprio lavoro, immaginando di avere di fronte i propri investitori (Gabriele, i professori e il sottoscritto) da convincere, sia dal punto di vista del valore tecnico che da quello commerciale. In 20 minuti, tutti hanno avuto il compito di mostrare le funzionalità del prodotto in termini hardware e software, con l’aggiunta di un possibile piano di vendita a sostenere il tutto. Grazie a quest’ultimo punto, anche i team non tecnicamente eccelsi avrebbero potuto “tenere il passo” puntando di più sul lato vendita e di design. Per rafforzare quanto detto poco fa, il codice non è nemmeno stato preso in considerazione al momento della presentazione: Gabriele, tuttavia, se n’è occupato in prima persona confrontandosi faccia a faccia con i ragazzi consigliando loro eventuali migliorie, solo per determinare i punti deboli lato sicurezza, ottimizzazione e qualità dei listati. Giudizi, non voti. Focalizzazione su attitudini, non su skill. Tutto quanto di ottimistico (o critico costruttivo) che possa aiutare i docenti nella valutazione finale. Vi è da dire che più l’edizione di Agile@School si ripropone e più diventa evidente l’importanza di focalizzarsi sugli aspetti della gestione del team. Ricordo ancora il primo anno, quando tutto era in fase embrionale, momento in cui ci siamo prestati ad aiutare i ragazzi sul codice vero e proprio, dimenticando il motivo per cui questo progetto è nato: fornire ai ragazzi gli strumenti e le attitudini per affrontare un qualsiasi progetto, personale o di team, che può prendere vita in un contesto lavorativo come nella sfera privata (time management). Ecco, fare una retrospettiva su questo, sempre in puro stile agile, ci rende orgogliosi dei passi fatti fino ad oggi e di quanto ne potremmo ancora fare, affinando tecniche ed organizzazione al fine di lasciare ai ragazzi un’impronta il quanto più possibile ispiratrice per il loro futuro. Per quest’anno è tutto, grazie per averci letto fino a questo punto. L’Internet of Things è un argomento di grande interesse ai giorni nostri. Quasi per gioco anche io che non sono un esperto in materia ma più un appassionato, ho iniziato tempo fa a “divertirmi” con un Raspberri Pi3. Il gioco si è trasformato in un tentativo di prototipo che potesse risolvere un problema reale (vedi la gestione della stagionatura dei salumi o delle galline nel pollaio, ecc.). Il prototipo mi ha spinto a comprare una mille fori, una breadboard estesa, dei sensori diversi da quelli disponibili nello starter kit e a studiare meglio in generale l’elettronica legata al Raspberry. Insomma, dalla curiosità ad un interesse di quella che è, come mi piace definirla, l’informatica “tangibile con mano”. Da qui siamo arrivati all’evento IoTeams a Parma, presso il Fab Lab. Organizzato da Engage IT Services, MF Labs e Officine On/Off, con la sponsorizzazione di Assitek, la giornata di workshop si è rivelata molto interessante. Insieme agli altri organizzatori abbiamo deciso di creare due percorsi, uno introduttivo basato su Windows ed uno interamente dedicato a Linux. Questo per coprire un po’ tutti i modi di accedere al mondo dell’IoT. 13 persone presenti distribuite sulle due track. 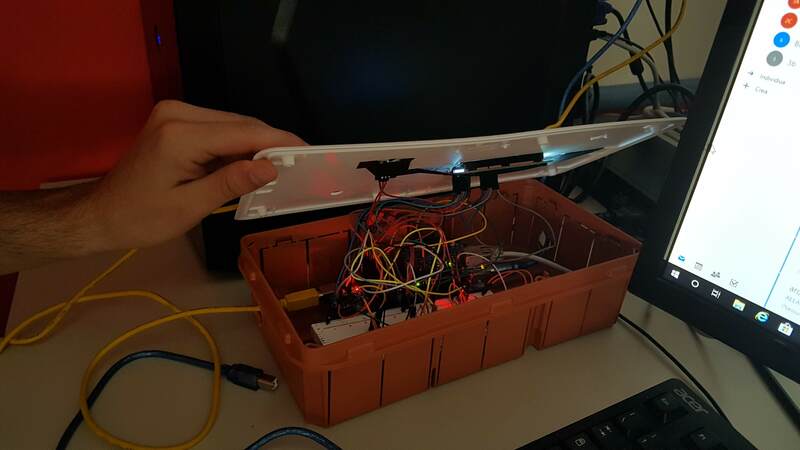 Lo speaker della track Linux è stato Mirco Ferrari (CEO & Founder at MF Labs, tech enthusiast) ed ha portato con se un kit Arduino ed una serie di sensori per realizzare, durante l’arco della giornata, una sorta di stazione metereologica. 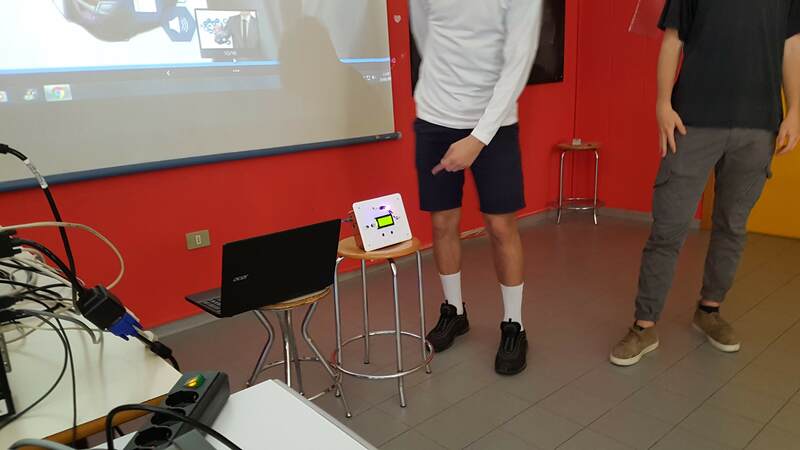 Anche in quest’aula, la prima parte della mattina si è focalizzata sull’introduzione all’argomento. 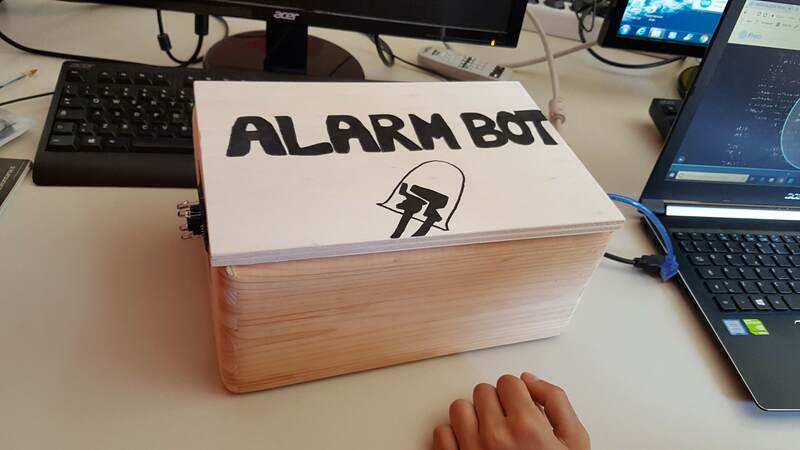 Nella seconda parte sono stati illustrati i protocolli di comunicazione nell’ambito dell’IoT. 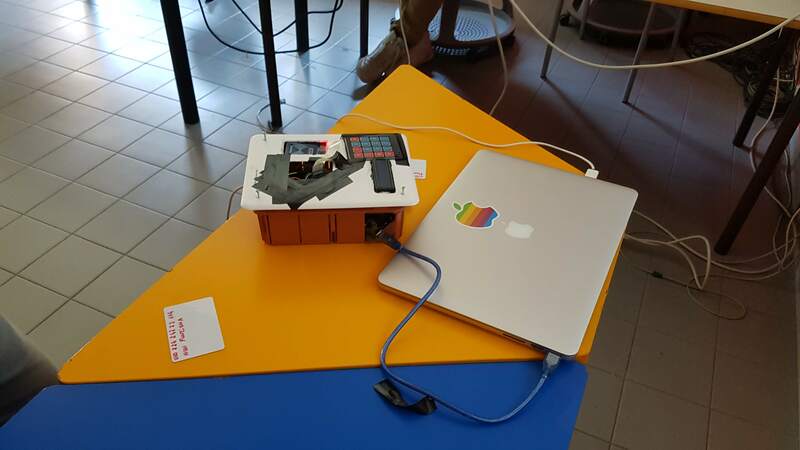 Di grande interesse è stata la parte in cui Mirco ha mostrato quali sistemi gratuiti esistono per poter allestire un prototipo IoT nel cloud. 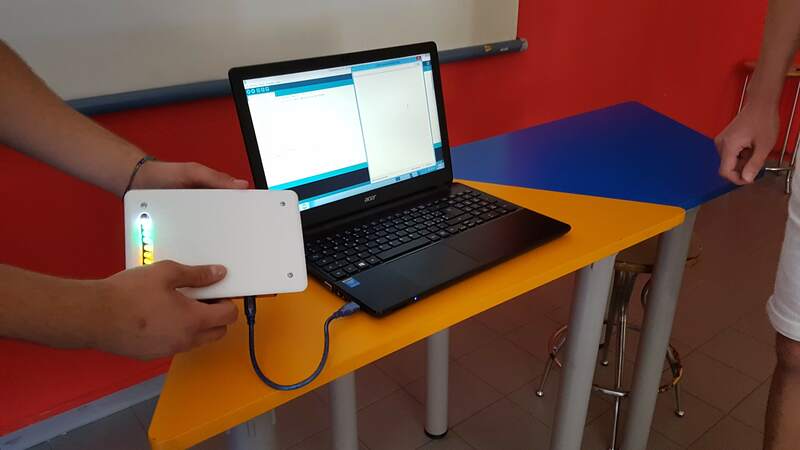 La dimostrazione ha coinvolto NodeMCU e una monitorizzazione interattiva diretta sui sensori. Anche questo percorso si è rivelato di estremo interesse e, come per l’altra track, oltre che l’utilità, si è proprio percepita la parte di “interazione” e “divertimento tecnico” dei partecipanti. Nonostante l’evento fosse un pilota devo dire che è andato piuttosto bene. I partecipanti si sono presentati tutti, puntuali e interessati alla materia, i gadget sono stati graditi, gli speaker sono stati ineccepibili. Un buon progetto, che spero sia destinato a contunuare già a partire dal prossimo anno. Ottimo risultato, insomma. Siamo quasi giunti alla fine di questa edizione di Agile@School presso l’I.I.S.S. Gadda di Fornovo, Parma. Nella puntata precedente abbiamo visto i diversi team presentare i loro progetti, venendo a conoscenza degli strumenti utili alla collaborazione e alla gestione efficiente delle attività tra cui Slack, Trello ed il concetto di retrospettiva mediante l’utilizzo di una starfish. A tal proposito è stato chiesto di presentarne una fatta da loro contenente tutti i punti, suddivisi nelle varie aree, che hanno raccolto nel corso dell’ultima settimana. Siete pronti? Cominciamo! Nel presentare le retrospettive, i ragazzi hanno mostrato ancora una volta una vasta creatività nella presentazione, andando ben oltre a quanto richiesto dal punto di vista visivo, giocando anche con il termine stesso di starfish per creare un risultato di impatto agli occhi della classe. 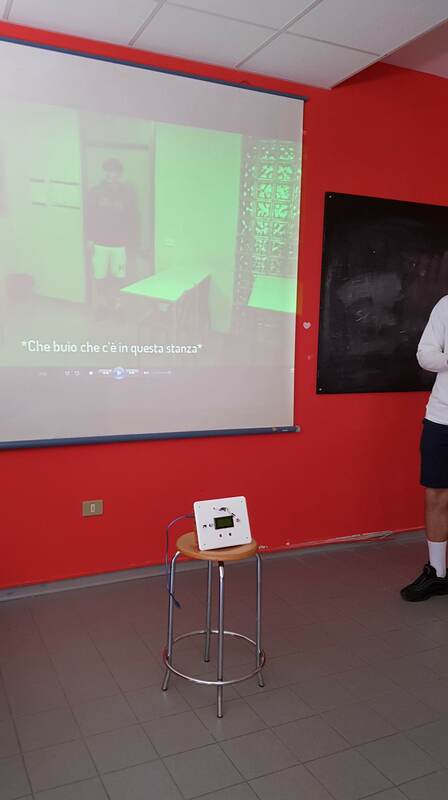 A presentazioni concluse, è emerso un ottimo spirito critico dei ragazzi nei confronti delle attività che hanno svolto questa settimana in cui hanno mostrato di aver utilizzato gli strumenti da loro consigliati in precedenza e, ancora più importante, di aver gestito positivamente le differenze e le diversità all’interno del team andando in generale d’accordo l’uno con l’altro risolvendo problemi di natura tecnica mediante una stretta collaborazione. L’unica nota “negativa” è data dal fatto che tutti i gruppi si sono concentrati troppo sullo storytelling e sull’aspetto grafico rispetto ai contenuti e alla loro suddivisione, portando a non soddisfare a pieno le nostre richieste. In ogni caso però si trattava della loro prima retrospettiva, pertanto ci è sembrato giusto chiudere un occhio su quest’ultimo aspetto apprezzando il loro impegno. Finita la retrospettiva, abbiamo chiesto ai ragazzi come stesse procedendo il loro lavoro e, con nostra sorpresa, è emerso che tutti i gruppi hanno già cominciato a sviluppare il software e a cablare i loro circuiti, arrivando a completare in alcuni casi più della metà delle attività da loro stimate in precedenza. Non è stato necessario fornirgli consulenza tecnica in quanto la scuola si è prestata ad aiutarli e sostenerli in questo percorso sia dal punto di vista elettronico, acquistando il materiale necessario e spiegando il corretto processo di cablaggio, sia dal punto di vista informatico, risolvendo eventuali dubbi di programmazion ed interfacciamento con i dispositivi. Non possiamo che essere contenti quindi del lavoro che hanno svolto, avendo l’ennesima conferma del fatto che agire sull’organizzazione e sulle metodologie che stanno dietro al lavoro pratico porta ad ottenere risultati tangibili e duraturi, anche nei confronti di chi come loro non ha mai avuto modo di sperimentare la cosa. Come compito per l’ultimo incontro, che avverrà venerdì prossimo, abbiamo chiesto ai ragazzi di portare una presentazione del loro prodotto con tanto di codice e circuiti funzionanti. Nessuna direttiva sugli strumenti da seguire, nessuno schema di esposizione: gli è stato permesso di sbizzarirsi con la creatività, alimentando un pò di sana competizione. Come finirà? Per scoprirlo, rimanete sintonizzati in attesa del prossimo post! Per oggi quindi è tutto, ci vediamo alla prossima puntata!